This month’s TV News in Russia looks at how Russian media are covering Russia’s presidential campaign. As is always the case every month, incumbent Vladimir Putin is dominating the airwaves with visits to factories, forums, and over the holiday season, to churches. Other presidential contenders are generally covered in blanket reports discussing the election in general and are not given serious, positive coverage. Several selected newscasts, representative of the coverage as whole, are presented below with English-language synopses. Russia Channel reports that a record number of candidates are running in Russia’s presidential election this year, including political veterans and newcomers. The channel rapidly introduced some of these candidates, giving sound bites on specific issues. The channel quoted LDPR Party candidate Vladimir Zhirinovsky as saying that the economy of the Far East should be made tax-exempt, which will result in an economic boom there. Communist Party candidate Pavel Grudinin was shown with party leader Gennady Zyuganov, with most of the airtime going to Zyuganov who said that “the country has become a besieged fortress. And our so called Western partners, who are ill-wishers, to be precise, do everything possible to destroy the country from within, and this cannot be allowed.” Grudinin was shown saying that he had a plan of 20 points that is “exactly what the country needs to get it out of the crisis.” No elaboration was given of the plan. The report then shifted to a Central Election Committee meeting discussing Grudinin’s foreign bank accounts and investments. Grudinin claimed it was a bank error as he had already closed out all of the accounts and investments. Growth Party candidate Boris Titov was shown visiting a detention facility in Moscow and speaking about the rights of businessmen in relation with law-enforcement. Civil Platform candidate Kseniya Sobchak was reported to have gone to Bali where was paid to entertain at a corporate party. She was shown denouncing the allegations, saying that the trip was part of a fundraising campaign. Lastly, Yabloko candidate Grigory Yavlinski was shown in his YouTube videos discussing a plan to give people plots of land for building dachas, which he said would result in booming construction. The final list of candidates will be completed by February 10. First Channel gave a much briefer report – only with statistics about the general quantity of candidates and parties registered. The only specific candidate named was Vladimir Putin. Russia Channel reports that the Co-Chairs of the Vladimir Putin’s campaign headquarters are Sergey Kogogin, director general of KAMAZ truck manufacturing plant, Aleksander Rumyantsev, director of the Oncology Treatment Center, and Elena Shmeleva, director of Sirius Educational Center for Gifted Children. Russia Channel reports that President Putin, following his tradition, celebrated Christmas outside Moscow. He visited one of the oldest churches in St. Petersburg, the Church of Holy Simeon, where his father was baptized. 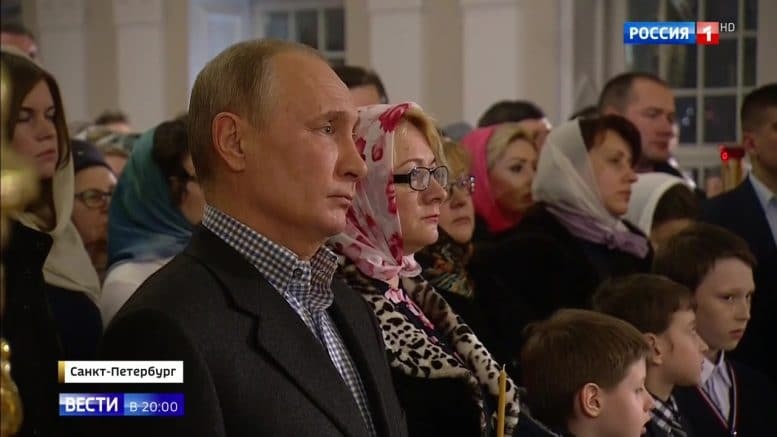 Last year, President Putin celebrated Christmas at the St. Yuri Monastery in Nizhny Novgorod, and in previous years, celebrated Orthodox Christmas in churches in Sochi, Karelia, Tver, Kostroma Region, and Yakutia. Vladimir Putin offered to make the minimum wage equal to the living wage starting from May, 2018. Russia’s economy is on the rise, the President said, which now makes raising the wage a possibility. The move would increase the incomes of about four million in Russia. First Channel also reports that the government will pay a 10,500 ruble allowance to low income families who have a second baby. Also, families with a second or third child will be eligible for state-subsidized mortgages. All these measures are a part of the large-scale initiative of President Putin to improve the demographic situation in Russia. Russia Channel reports that President Putin visited Tver Carriage Works which supplies train cars not only to Russian Railways, but also to some other countries, including Egypt. The President told the plant workers at the meeting that the government would encourage export via various measures, including giving loans to customers. Russia Channel quotes President Putin as saying that “Ukraine has, many times, asked about receiving military equipment left in Crimea. I will take this opportunity and say that we are ready to continue this process. We are ready to hand over Ukraine the warships which are still in Crimea, aircraft equipment, armored equipment. However, it is in very poor condition. It is none of our business, it had been like that, without maintenance for years.” According to Russia Channel, in Sevastopol, on dry lock, there are “dozens of rusting warships, and the unfortunate submarine Zaporozhets, the only submarine in their Navy.” The Zaporozhets has never gone underwater because of its poor condition. Russia Channel quotes president Putin as saying in an interview that the Communist ideology is similar to Christianity, as both share principles of freedom, brotherhood, equality, and justice. The president also said that burying Lenin in the mausoleum is similar to the Orthodox practice of keeping holy relics. First Channel quotes President Putin as saying at a meeting with defense plant workers that the average interest on mortgage in Russia is lower than 10 percent, and people who will have the second or the third child, will be able to pay mortgage with reduced interest, not exceeding six percent, with the remaining amount to be paid by the state. First Channel reports that the presidential election campaign in Russia is in high gear, stating that “regional campaign headquarters for Vladimir Putin have opened in every region of the country. Vladimir Zhirinovsky is trying hard, as he does not want to be in third place, but second. He has already spent 116 million rubles on the election campaign.” Another active candidate is Maxim Suraikin, Chairman of Communists of Russia party (not be confused with the, Communist Party of the Russian Federation which has representation in the Federal Duma). “Another leftist candidate,” Pavel Grudinin, of the Communist Party of the Russian Federation (KPRF) “too confusingly answers the question about his wealth, his accounts abroad,” First Channel states. Another candidate, Boris Titov from the Party of Growth, advocates reducing the tax burden on business. Boris Yavlinsky, the long-time head of the Yabloko Party, calls for giving more authority to local governments. The report stated that Vladimir Putin has 1,600,000 signatures in his support, or more than six times as many needed to register. Among those who signed are famous actors, athletes, and musicians. Putin has opened a reception office in downtown Moscow, on Novy Arbat, where people can come to tell his representatives about their issues, such as problems in buying properties and social issues. Kseniya Sobchak “is trying on the image of civil rights activist”, First Channel states, quoting her as saying that she wants to make a difference. The Central Election Committee is still reviewing documents for 14 candidates who have applied. The committee has investigated KPRF candidate Pavel Grudinin for seeking out Sergey Udaltsov, a political activist current serving a prison sentence person who was in prison for organizing street disorders. Grudinin was forced to dismiss Udaltsov from his campaign. First Channel reports that Vladimir Putin spoke to Kazan University students at the Kazan Youth Forum. Putin advised students to pay special attention to internships in order to get good jobs in the future, and recommended the university administration and student councils help to arrange internships for students. Russia Channel quotes President Putin as saying to students at The First Convention of Student Clubs in Kazan that “due to students, young people, Russia remains young, daring, looking to the future.” He said that today, young people have more advantages compared to the previous generations, as they can create freely new meanings, new fashion, new music, new art, and new technologies. At the meeting at Kazan University, Vladimir Putin spoke about the ten federal universities which were established in 2010 in a major reform of Russia’s education system, saying that the Federal Universities are intended to become the flagships for industrial, social, technological development of Russian regions and industries, facilitating the development of such strategically important regions for Russia as Arctic, Siberia, the Far East.